The new Krispy Kreme doughnuts I posted about last week have been released and (thanks to my mom) I was able to get my hands on 2/3 flavors. She sent me a text saying her appointment was near a Krispy Kreme shop and she generously grabbed me a Tiramisu and a Crème Brûlée doughnut. (Thanks mom!) They were out of the Churro variety, but to be honest, that one seemed rather lazy to me. It's just a cruller dusted with cinnamon sugar, and I doubt it's really worth checking out, so without further delay, let's get this review started! First up, Tiramisu. This is the flavor I was most excited for. Real Tiramisu is made with lady fingers soaked in espresso and brandy, layered with mascarpone cheese, and topped with cocoa powder. 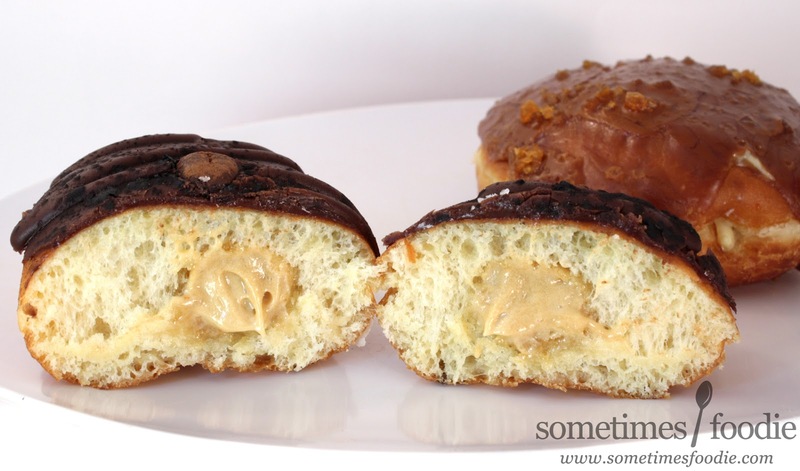 It's a flavorful, decadent, coffee-flavored dessert and I thought it would translate really nicely into a doughnut. 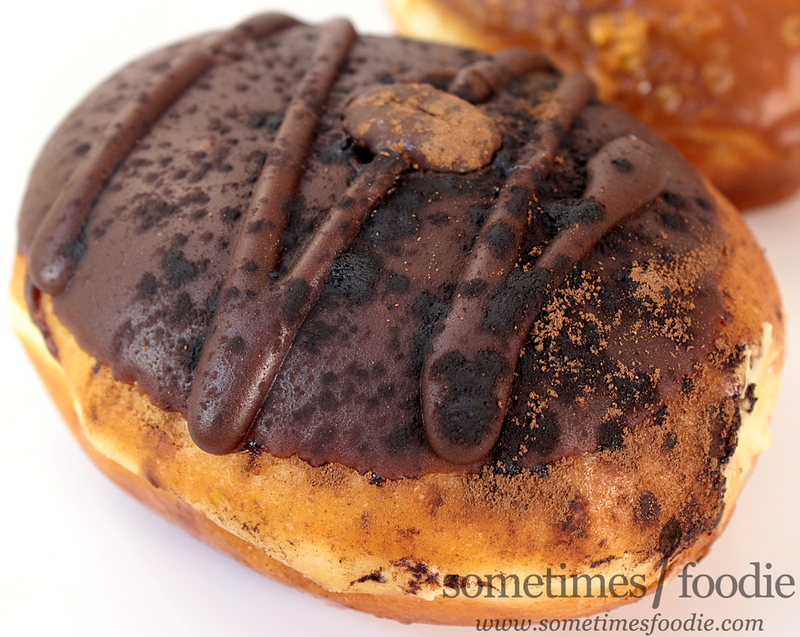 The Krispy Kreme version is a classic doughnut shell, filled with a "Tiramisu Kreme" dipped in dark chocolate "tiramisu icing" and topped with dark chocolate drizzle, chocolate cake crumbs, and a chocolate coffee bean. Pretty fancy. The one I got doesn't really look as puffy and perfect as the promo image, but it does look very Tiramisu-like. Instead of my usual bite-test, I grabbed a knife and cut it in half to make sure I got a good kreme-to-doughnut ratio in my first bite. Looks like there's plenty of kreme in this one! Dunkin' Donuts needs to take a page from the Krispy Kreme book. I took a bite and it was delicious! The filling has a lovely sweet, but concentrated, expresso flavor that's very reminiscent of the syrup used to soak lady fingers for the real dish. The filling isn't overly sweet, so the chocolate icing helps balance out the coffee-intense-ness of this doughnut and overall, it tastes great! 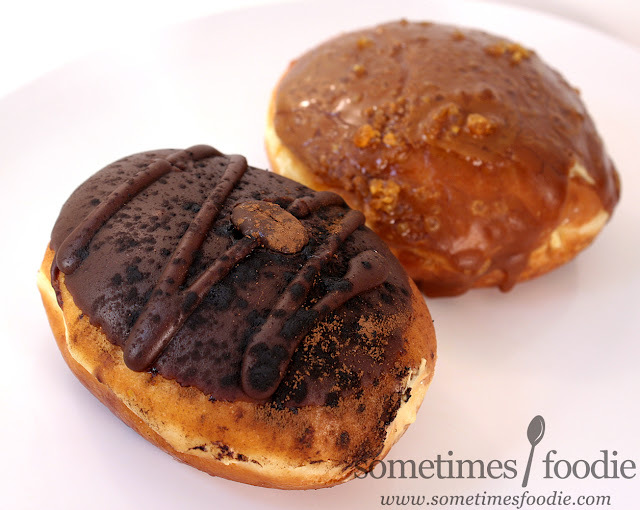 I will say that the coffee bean on the top wasn't as good as Meiji coffee beat chocolate, and "cake crumbs" is a bit of a stretch for this bizarre, almost flavorless, powdered topping, but neither one of those things gets in the way of enjoying the rest of the doughnut. Next up, the one my mother and sister were most excited about, the Crème Brûlée. It's one of their favorite desserts. Actual Crème Brûlée is a pot or ramekin filled with a vanilla bean-based custard, and topped with sugar crystals. Before serving, a brûlée torch is used to caramelize all the sugar on the surface creating a delicious, crunchy, caramel-y sugar shell on the top. 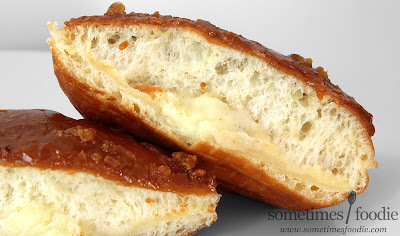 Krispy Kreme's version of this sugary dessert is another doughnut shell, this time filled with a vanilla bean custard, topped with caramel icing and "crème brûlée" flakes. Now this one is pretty rough looking, especially when compared to the delicious promo image. The brûlée "flakes" look like sugar in the raw to me, and as they sit in the display case they melt into the caramel icing making this look rather messy and not-so-great to photograph, but it smells great. Very sugary and caramelized. I grabbed my trusty knife for another doughnut dissection, this one looked like it had less kreme than the Tiramisu, but the kreme that I can see has actual flecks of vanilla bean in it, so that's a good sign. I took a bite, and MAN is this thing SWEET. It's crazy sweet and instead of crème brûlée this makes me think of sugar-free caramel coffee syrup. 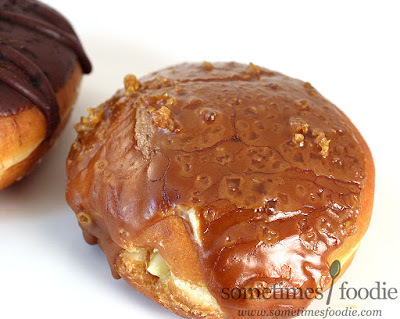 The doughnut part is great, light and fluffy like always, but the caramel topping is intensely caramel flavored and sweet, mixed with sweet sugar crystals, and a sweet vanilla kreme inside. The custard filling on it's own is okay, but something about it seems a little off. It tastes kind of like artificial sweetener to me instead of actual sugar, and that artificial sweetness mixed with all the other sugary flavors in this doughnut is just too much for me. My mother and sister were really looking forward to this one, and sadly, they didn't care for it either, and they LOVE crème brûlée. They felt it was too sweet and caramel-heavy, and not custardy like their favorite dessert. I'd have to agree with this. This is more caramel than crème. If you're REALLY into caramel and you like your sweets extra sweet, the crème brûlée doughnut it right up your alley. Me? I think the Tiramisu is the hands down winner! I don't even have to try the churro doughnut to know for sure that Tiramisu is the best of the bunch. I highly recommend the Tiramisu to all coffee and Italian dessert fans, and I would definitely repurchase this one. It's one of the best coffee-flavored doughnuts I've ever had and I'll be sad when it disappears. Thank you for the review, they both look phenomenal! I personally love sweet things so I'm actually really hoping to try that creme brulee donut now, but shucks, I just wish a Krispy Kreme was closer to me! I wonder if they'll carry these in any stores that sell Krispy Kreme donuts (such as Royal Farms); I know they probably won't be as good as when served fresh, but it's better than none at all!